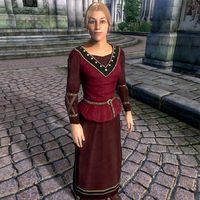 Caula Allectus is an Imperial commoner residing in the southeast corner of the Imperial City Temple District. She lives with her husband, Amantius Allectus, whose journal is the target of the Thieves Guild quest, May the Best Thief Win. Caula also frequents the Five Claws Lodge in Leyawiin. Caula wears a set of middle class clothing: a burgundy linen shirt, burgundy linens and a pair of thick cowhide shoes. She carries her house key and a small amount of gold. Caula is evidently dedicated to her husband. As long as the quest May the Best Thief Win is <= stage 20, Caula will greet you with "My poor husband is getting no sleep. He's awake all night taking care of those stupid plants." every time you talk to her. After this point, she will sometimes use the greeting "I'm Caula Allectus. My job is making sure my husband Amantius doesn't go out with his clothes on backwards. It's cute, really. Such a genius, and can't find his own socks. It's a full-time job keeping him in matching outfits." instead, but only 20% of the time. When asked about the Imperial City, she replies "I find things to do. I manage the house, make sure Amantius doesn't starve or run out of ink."